WhatsApp has over 1.2 billion users globally and is undoubtedly the most preferred messaging app. WhatsApp’s popularity exceeds age differences and has members from every age group actively participating in conversations on WhatsApp. While the messaging app is highy convenient, but it does come with its own set of drawbacks. One of the major issues is spreading of fake news, spam and phishing links that are shared across users. There have been plenty of hoaxes and spamming targeted at WhatsApp users. 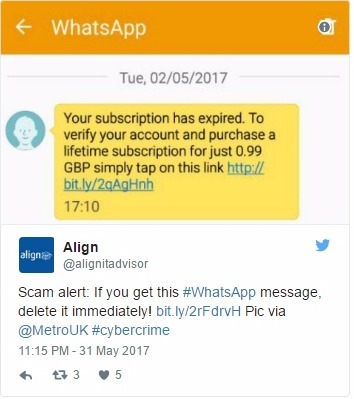 This time, a text message is doing rounds that asks users to pay a fee for lifetime subscription on WhatsApp. Reported by the Independent, the text message is being circulated asking users in the UK to pay a nominal fee to continue their subscription. The message reads, “Your subscription has expired. To verify your account and purchase a lifetime subscription for just 0.99 GBP (Rs 82 approximately) simply tap on this link.” A link is shared as well which could be a way for the attackers to get inside one’s smartphone and access their data and software. An image of the text message has been shared on Twitter as well, where the sender’s name reads WhatsApp. Since the message falsely portrays being from WhatsApp it may appear believable to some users. The fee amount isn’t a big one and this could also fool people into actually opening the link. While there may people smart enough to ignore these messages, there are those who could easily fall prey to this scam. WhatsApp is a free messaging service and does not charge users for any kind of subscription. If any user receives this text message or any similar message on WhatsApp, it should be ignored and not forwarded to other contacts. Moreover, if these messages come from people who are not listed on your contacts, it’s advised that they be blocked immediately. Also, those who may have opened the malicious link should download an anti-virus app on their smartphone to check for any malware or virus. Earlier last month, something similar happened in relation to WhatsApp. A text message was being spread around asking users to click on the link which is supposed to take them to WhatsApp. The link entices users to download WhatsApp with a different theme color. Cybercrime is encroaching on a serious level and smartphones are one of the easiest ways for attackers to exploit people. In the case of WhatsApp, users are advised not to believe any information coming from third-party sources. If there is any update, then it will be available on the official WhatsApp app on Google Play Store and App Store.